Today I was looking to do a "most of the day" hike, but I didn't want to get up early and I didn't want to drive too far. 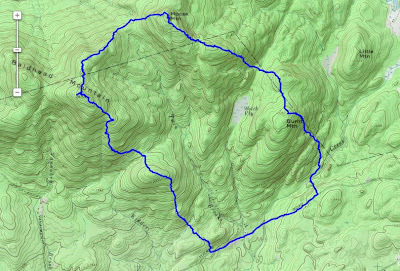 I looked at my list of "to do" hikes and came up with a new one that had just been referred to me... Baldhead Mountain and Moose Mountain in the Wilcox Lake Wild Forest. These mountains are located west of Warrensburg, and just north of Stony Creek. 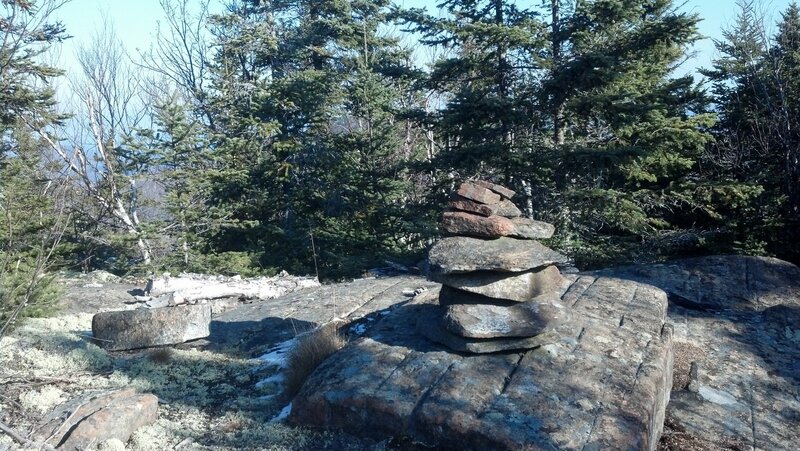 They are just south of Crane Mountain (another fine hike). I decided to do a loop hike and go up Baldhead, then over to Moose, down over Burnt Mountain to the road and back to the car. 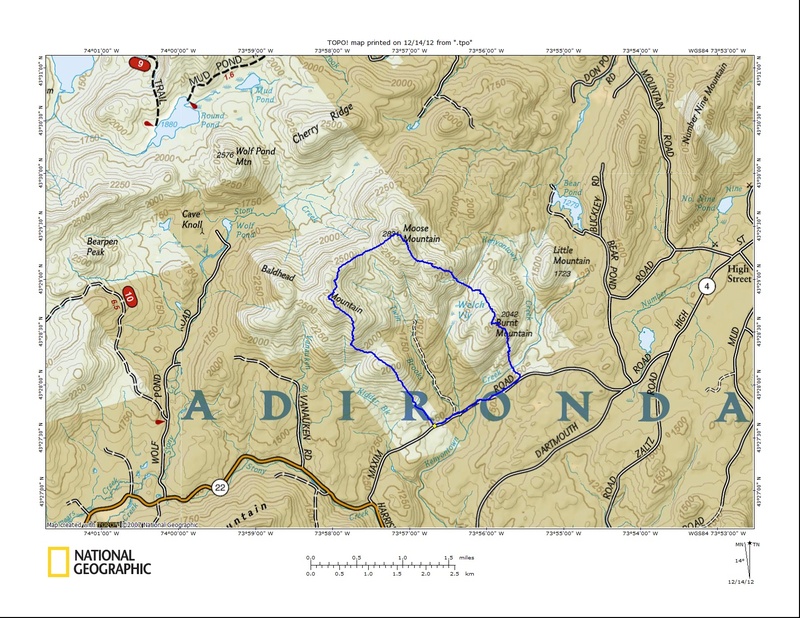 If you look at the map at the bottom of this post, you can see that there is a sizable section of private land inbetween parcels of state land, necessiting my upsidedown horseshoe hike. It was that or go back down the way I came. I chose to do the loop and walk the mile on the road back to the car. I started the climb towards the first unnamed bump south of Baldhead. It was open hardwoods, but I got into some thick prickers for awhile. 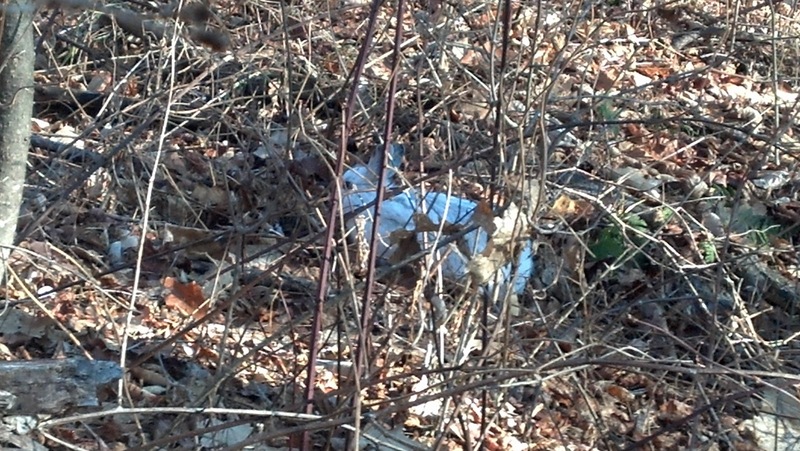 I was rewarded however with a visit from a Snowshoe Hare. It's funny, I just saw one yesterday on Niagar Mountain, but didn't have time to get a picture. This time, he stopped and watched me while I took his picture. As usual, my dog Rev was ahead of me, so she didn't see it. Once the hare started to hop ahead, Rev caught a glance and it was off to the races. Rev, to her credit, did come right back to me when I called out to her and told her to leave it. The prickers ended just before the first bump and they weren't a problem the rest of the hike. After the first bump, there was a small downhill section and then I began to make my way up Baldhead. 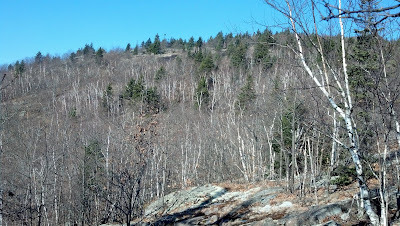 It was a nice climb and there is lots of sloping rock that's not difficult to negotiate. 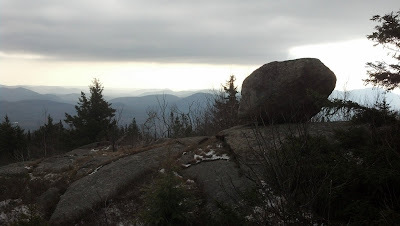 I could see the summit ridge up ahead and there was a band of rock there as well. 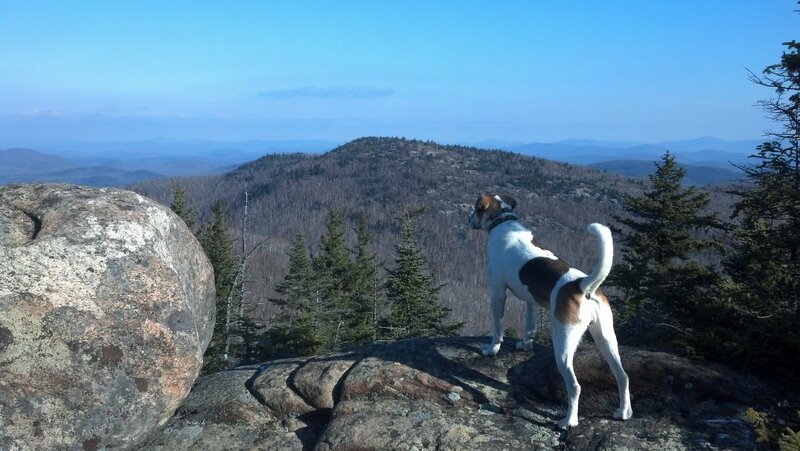 The summit of Baldhead is in and out of some spruce, but there are some fine views, especially of Moose Mountain and Crane Mountain. Be sure to poke around. There's lots of nice little nooks and crannies with views. 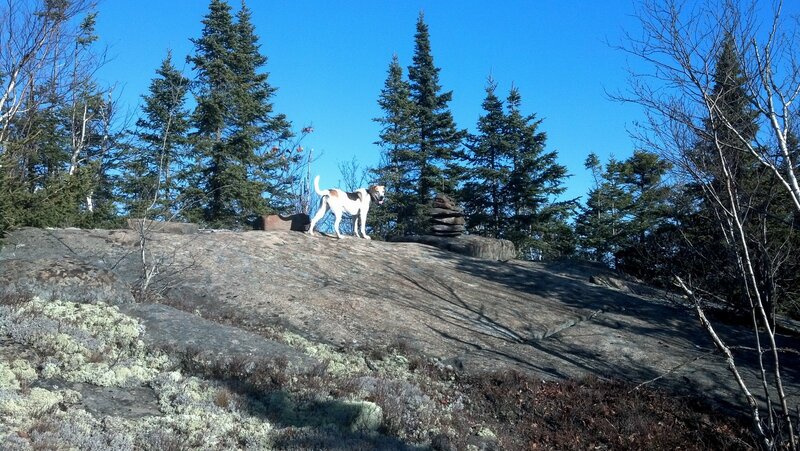 I could tell Moose would be a nice summit. You could tell the summit was mostly open. After leaving Baldhead, we followed the ridge that hooks around towards Moose. The walking continued to be easy. It's nice in the hardwoods with the leaves down, you can easily tell which way to go without looking at your compass. You can see the mountains in front of you. As we bagan our climb up Moose, some clouds began to roll in. 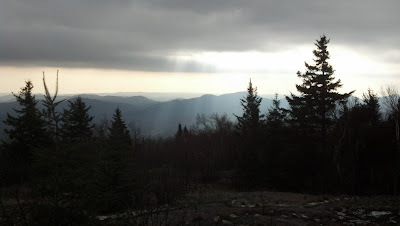 We never did get any precipitation, but the sky was darkening. Moose has even more open rock than Baldhead, and is a very enjoyable peak. The view to Crane Mountain are great. 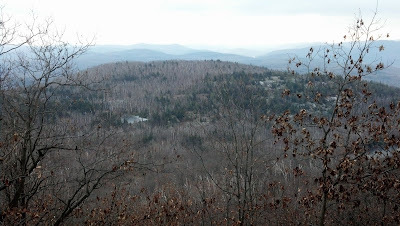 You can also see Gore Mountain in the distance. 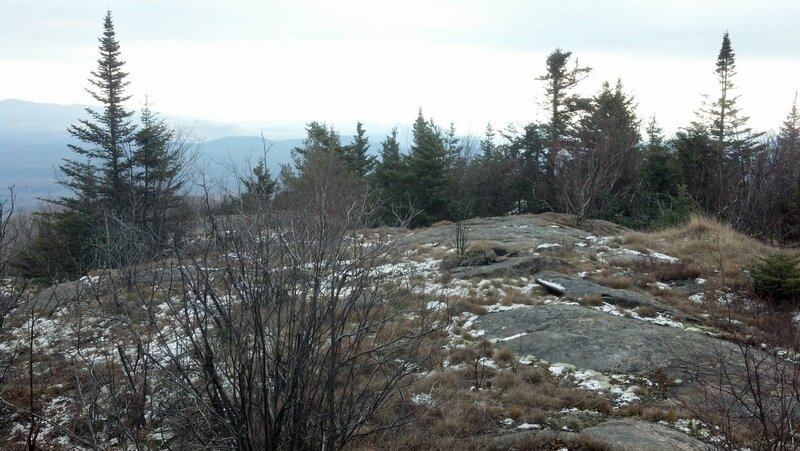 We were on the summit of Moose at noon and chose a nice grassy spot to sit and have some lunch. It was interesting to watch the changing sky. It almost looked like a sunset to the west and it was only noon. 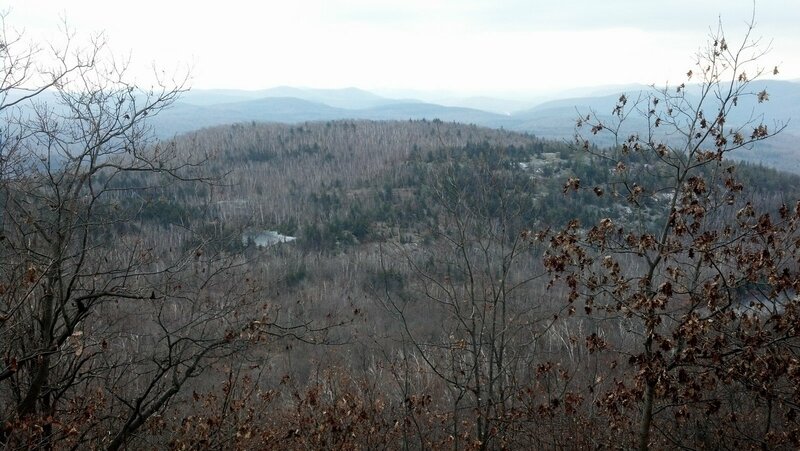 Our last stop of the day would be to descend south via Burnt Mountain. 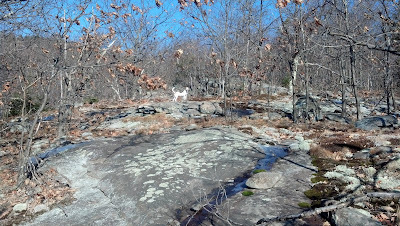 There was also a small pond that I could see on the shoulder of Burnt Mountain that I wanted to check out. It wasn't shown on the map. 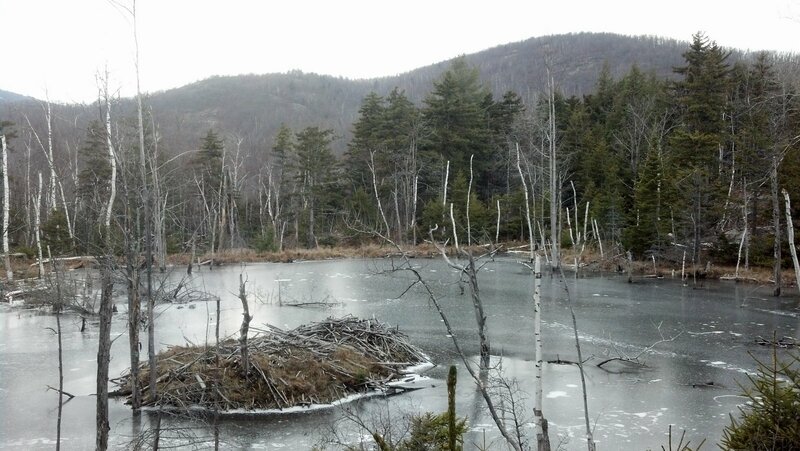 When we got down to it, it turned out to be a beaver pond. 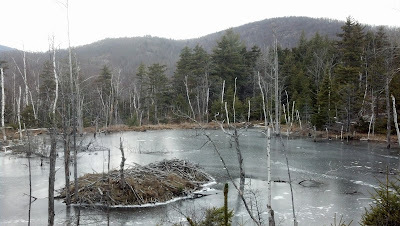 The pond was starting to freeze, but still not a lot of ice for this time of year. Burnt Mountain was not much more than a bump on the way out. I was careful on the way down to follow a course to stay on the thin strip of state land that reaches the road. Once at the road it was less than a mile back to the car. I found this to be a great loop hike. Alternatively, an up and back to Moose would be nice as a shorter alternative. 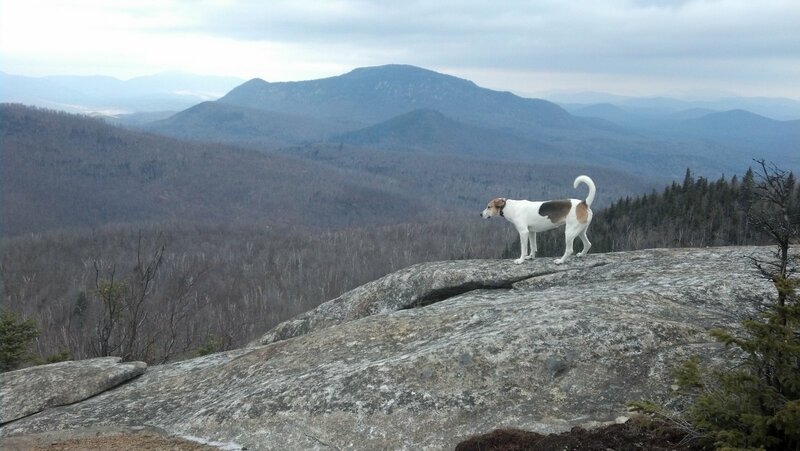 Looks like another nice hike. 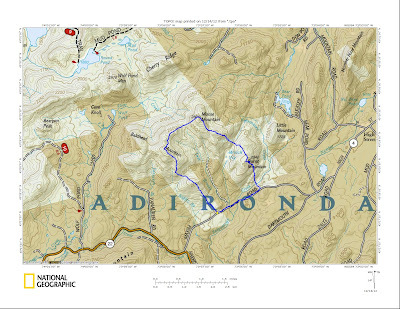 You're really getting a lot of great hiking in this fall!